It has not been often that I follow a news for long with such unadulterated passion. The 1 lakh car has been one of them. I had read every conceivable article, magazine reports, rumors and predictions of the car, including the parts that will be outsourced and to whom and the innovations required to meet the cost factor. Meanwhile there had been a lot of setbacks for Ratan and his team including the protests by farmers, mockery style statements issued from competitors questioning the mere possibility of it and almost everyone jumping in to say that 1 Lakh price target atleast is difficult to meet. Ratan and his team went on without paying any heed to all this and they achieved the impossible. Kudos to them. And today when I saw it live, Ratan driving the car in stage I felt speechless. It is a moment of honor to every Indian and a historic event which the world will look back many times in future. * It will take 4 people in a space lesser than M800 and I don’t think it is going to clog the traffic. Isn’t it better than a couple with their kids traveling on a bike in rain. Above all, consider a middle class Indian family. Before this their dream of a car could have been only a dream. One Man has thought it was possible and he had showed it to the world. Now his dream has made million dreams become reality. Kudos to Mr. Ratan Tata. We are proud of you. Let us all wish Rajni and Shankar and Robot a great success. 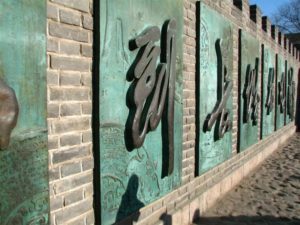 A few things intrigue us from our childhood and ‘The Great Wall’ was one such thing for me. It has always been my wish to lay my foot on it one day and so when I got an official travel offer I made up my mind to visit it somehow. But it turned out that my travel had to be for just a few days and so I just had one Sunday (the day of my arrival in China) to make it to the wall. Undeterred I made a plan to visit it as soon as I landed. My flight landed at 8.30 AM in the morning and by the time I reached hotel it was 9.30. The entire journey from Bangalore to Beijing lasted a day as there was a long wait at Singapore. My colleague accepted to accompany me to the Great Wall and we left off at 11.00.
was almost shaking. Lucky that my colleague advised me to get some warm clothes for rent at the base and I was saved. 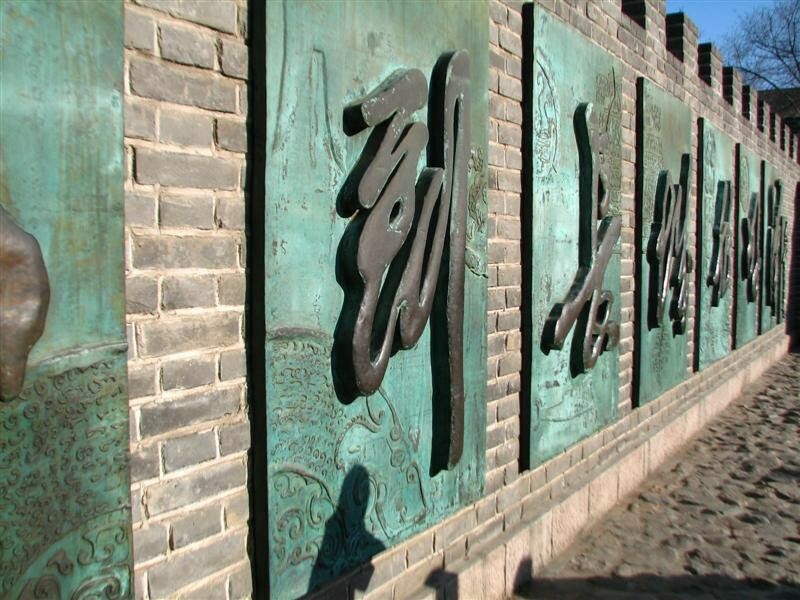 I liked everything about it, the history, the present state and the 2 hours walk uphill and downhill on the wall. 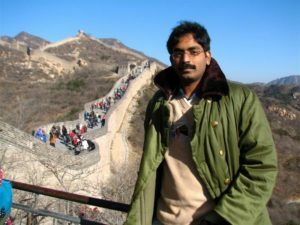 It is not a single wall as what people usually think it is, even after Shankar’s Jeans. It is sort of a solid structure with walls on either side, one of them being higher than the other and facing the enemy territory. There were also place for the soldiers to be grouped and hidden, watch towers too. 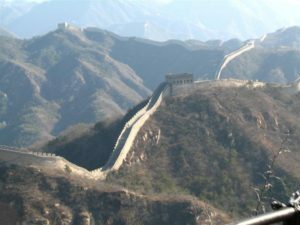 Another point that is usually missed is that there is enough space for 10 people to stand side by side on top of the wall structure with the walls protruding on the 2 ends. Yet anther fact that I came to know was that a male is considered ‘Man’ if he is able to walk the entire stretch of the Govt renovated wall up and down and believe me it was not an easy task. What carried me on was the enthusiasm I had for it. 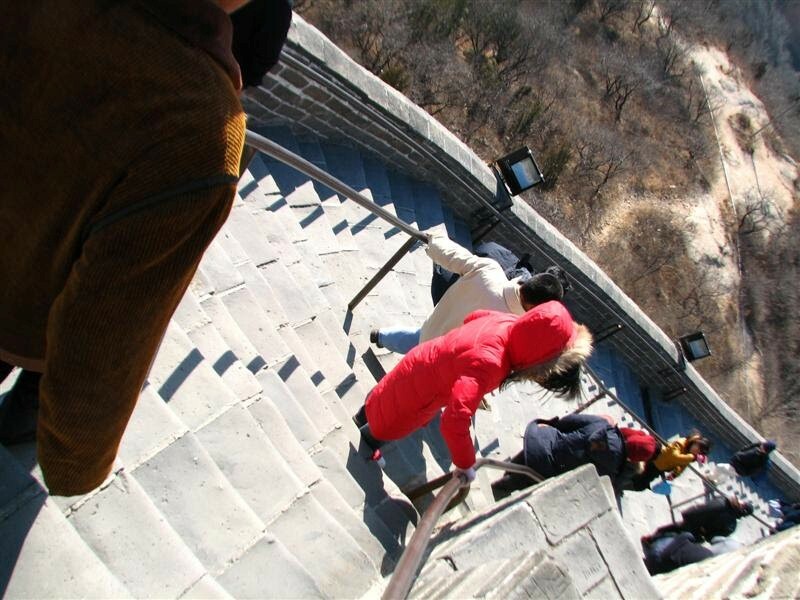 The wall is steep with steps in many places and in some cases no steps even and to walk stable on it in a freezing temperature is worse enough. I couldn’t get how someone could fight after all this and why would someone else try to climb over it to capture the other side. Otherwise I didn’t move around Beijing much. I felt it more like India and liked the place very much than the deserted Irvine (US). It looks like 6-8 years ahead of Bangalore in everything. The apartments were like 40-50 floors high and dense. Land is a scarcity there and there was no new apartments to be had anywhere close to the city. They had ring roads (5-8 levels atleast) running around the city. Too many taxis take care of your transport needs and most of them were Hyundai Elantra. The Bus connectivity also looks good. Food was my favorite. I ate almost everything that was put forward and since my colleagues weren’t the extreme types they did not go for snakes or scorpions but resisted themselves with Chicken, Mutton, Beaf, Goose, Duck, Octopus, Dog and a few similar items. Everything that I ate was good and far far better than the Chinese restaurants in India and Irvine. Olympic city was coming up for the 2008 session in Beijing and I still do not understand how they could lay their hands upon such a big area at the heart of the city for constructing such big stadiums. People were looking good and mostly similar.